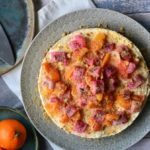 Hey, remember when I had a semi-proper food blog on which I often posted recipes, instead of moaning about how busy and exhausted I was and listing all my new burns? No? I don’t. 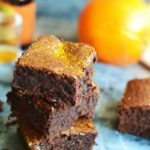 I had to plough back through the archives to find the last recipe I posted, and it was only for what is essentially a fridge cake. A delicious fridge cake with an exciting name, but still. My first term at Leiths finished a couples of weeks ago, and I am metaphorically (and sometimes literally) spinning round in a circle going ‘wait, whoa, wow, what just happened to me?’ I’ve been ambushed by term. I’ve been completely immersed for ten weeks and I haven’t thought about anything else. I’ve been muttering choux pastry recipes to myself and having nightmares about underproved bread. Term ended, and as soon as I got home and relaxed for the first time in months, I immediately got ill, and spent a few days wrapped in duvets on the sofa, holding the cat hostage, slipping in and out of sleep while watching box-sets. It’s time for me to start cooking for fun again. Macarons are fun. I mean, they’re a complete pain in the arse, but they’re beautiful, and delicious, and fancy. 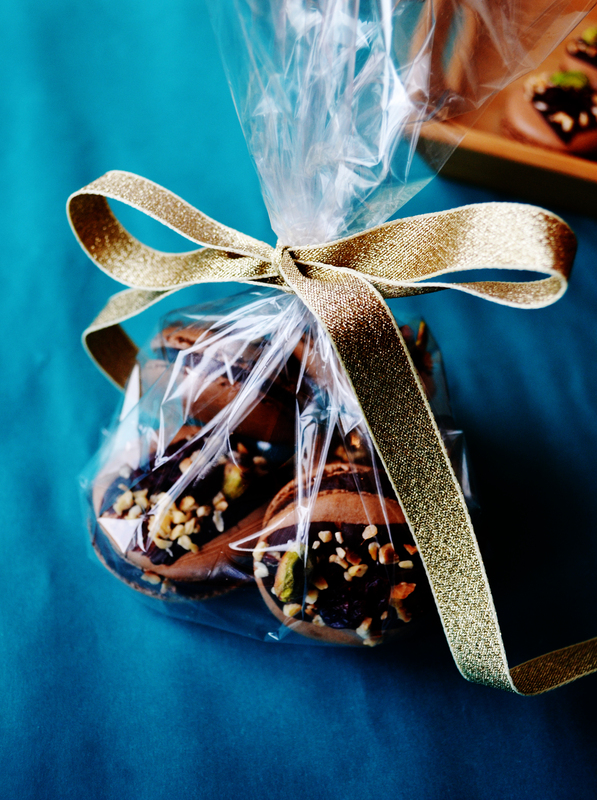 These chocolate orange macarons are decorated with nuts, and I think they look pretty enough to be rather nice gifts for Christmas. I mean, for someone you really actually like. I do not claim to be a macaron expert at all. They’re notoriously tricky, and there are dozens of very good, comprehensive, and knowledgeable articles and blog posts floating about that will give you dozens of tips about how to make them perfect. BraveTart‘s writing on this is a fantastic resource that I would recommend you reading if you’re interested. I’ve found a method that works for me now and I am sticking with it, but it’s certainly not inherently better than any other method. Much to my own surprise, I’ve found the Italian meringue route actually easier than the French one here – which is odd because any recipe which involves heating sugar syrup to precise temperatures usually freaks me out a bit – as it tends to give me more consistent results. And it’s not as scary as I thought it was. For this, you will need at least three baking sheets (I sometimes go onto a fourth) and parchment to line them, a sugar thermometer, a food processor, an electric hand whisk or a stand mixer, and a piping bag fitted with a plain nozzle, as well as the normal bowls and scales and stuff. Sorry, lots of kit I know, but that’s just how it is for these. 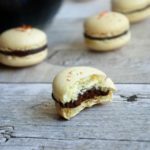 This recipe makes around 50 shells, or 25 paired macarons, although this obviously depends on how big you pipe them. I don’t personally think you need to bother ageing your egg whites unless they are stupendously fresh to start with – perhaps you have your own chickens or something, who knows – but I do always make sure mine are room temperature. I am not awesome at piping, and so my personal preference is to line my baking sheets with disposable parchment and, using a cookie cutter, draw circles onto it in black Sharpie as a guide, then flip it over ready to be piped on to. You can also buy templates that are already on silicone mats (which I should do but I am cheap) or print them off the internet, or just pipe freestyle if you are confident. You want to end up with something like this. 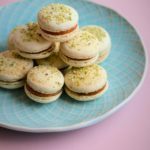 I could go on and on about macarons but I have been quite brief in the recipe below. If anything needs clarifying or you have specific questions, do ask. I am also happy to add step by step pictures if they are needed. Get out three baking sheets and line them with parchment (or silicone), and create a template if you need one. Pop your water and caster sugar in a saucepan, stir it gently together with a wooden spoon, and put the pan on a low heat to dissolve the sugar (starting with hot water speeds this up). 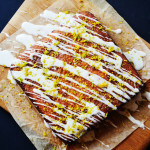 While that’s happening, pop your almonds, icing sugar, and cocoa in a food processor and blitz for 1 minute. Scrape the sides down, then blitz for an additional minute. Pass the sugar and nut powder through a sieve into a large bowl. You will be left with some chunkier almond mixture in the sieve. Chuck this away, don’t force it through – you want smooth macarons. When the sugar syrup hits 115 degrees, pour it into the egg whites in a thin stream while still whisking them on high speed. The mixture will become shiny. Once all the sugar syrup is in the whites, keep whisking for five minutes or so while the bowl cools until you have your stiff meringue mix. Whack 1/3 of the meringue mix into the almond paste and beat it in any old how to loosen it. While they are resting, make ganache. Break your chocolate into small pieces and pop it in a bowl. Heat your cream in a pan until it’s just steaming and little bubbles are appearing at the edges. Pour it onto the chocolate and leave it alone to sit for a couple of minutes. Beat the mixture until smooth, then beat in the butter, then add your salt and orange extract/ zest to taste. Leave to set in the fridge. Heat your oven to 160C/140C fan/gas 3. 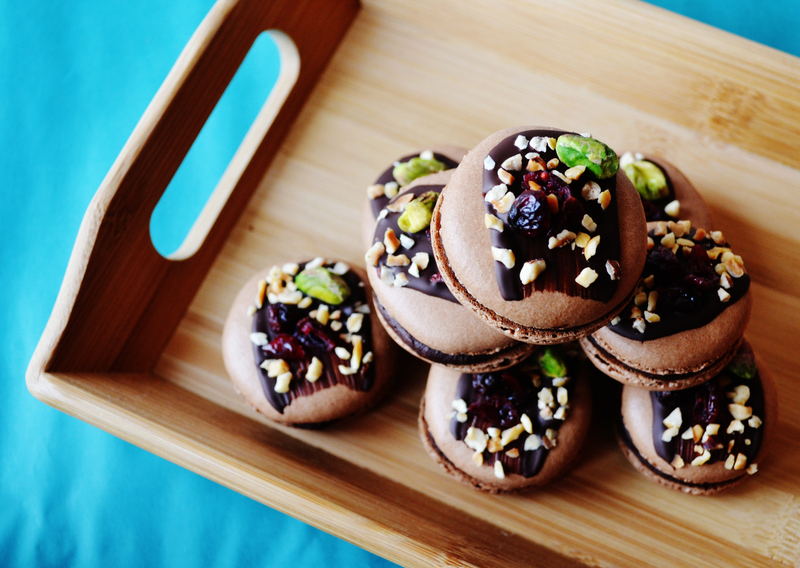 Bake your macaron shells for around 20 minutes. This is obviously dependent on your oven and the size of your macarons, so keep an eye on them. Check after 17 minutes. When your shells are cooked, they should lift off your baking parchment without leaving much residue behind. If they are leaving lots of very sticky mixture, give them more time. If they are completely dry and hollow then they are over-baked (but will still be yummy when filled). When they are done, get them on a cooling rack and once they are cool enough to touch, take them off the parchment. 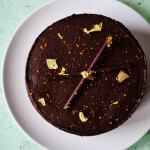 Get your ganache out the fridge – it might need a couple of minutes at room temperature to become pipeable, depending on how long it’s been in there. 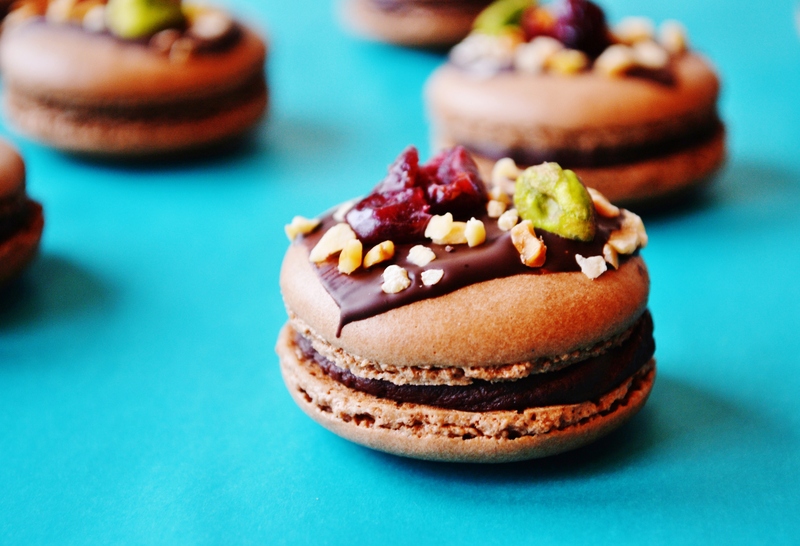 Match the shells of your macarons into pairs of similar sizes. Pipe a circle of ganache onto the base shell of each pair and gently sandwich on the top shell. You are now free to decorate. 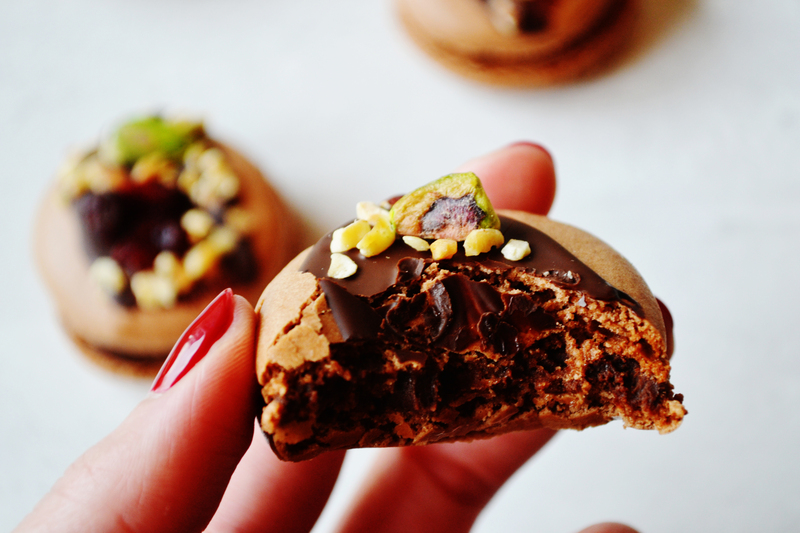 Here, I dipped a (clean) paintbrush into melted chocolate, brushed the top of each macaron, and then sprinkled cranberries, pistachios, and toasted chopped hazelnuts on top. But go wild – or don’t. They will be lovely plain or with a simple dusting of cocoa powder. And there you have it. What an incredibly long recipe. It will all be worth it in the end. Really, you should store macarons in the fridge in an air-tight container for 24 hours before eating them to let the shells soften into the filling but my willpower isn’t always up to this. Regardless, they keep very well.